Once upon a time, I used to make ginger beer, recycling glass beer bottles for the purpose. We had some with us one time years ago when I was travelling by (even-then-antique) Kombi. We stopped at a wonderful national park, near Hattah Lakes. There was a long walk in intense dry heat. We walked much further than we planned, perhaps having failed to fully understand the map on the sign before setting out. The water in the lakes was so low that we eventually realised we were not seeing eels in the lake, we were seeing the spines of large fish as they swam in water so shallow that it was barely as deep as the fish were tall. We got back to the Kombi, and since we’d been walking for hours, and we were on holiday, opened up the back of the van and lay down on the bed for a nap. We’d been there a little while when there was an almighty bang. We sat up pretty quickly, because to our untrained ears, it sounded like a gunshot. There were no other people in sight and only one car in the distance. All fell quiet. No dramatic action. Eventually realisation dawned on one of us, and the three way (gas–electric–car battery) fridge was opened. Inside it were the remains of a bottle of ginger beer which had exploded under the pressure of its own contents, sprayed though the vegies and suchlike. Three cheers for the fridge keeping the glass shards safely contained. Long story short–all bottles of ginger beer stashed under the bed were emptied right there and then, and I never put ginger beer in glass again, except once the lid was off! In case you can’t tell, this is a sideways introduction to my circumspection about the state of my steeping jars of dyestuff. I’ve had some difficulty getting a good seal with with the Stuff, Steep and Store method. The first time, I think I raised the temperature too quickly. It’s a vice I’ve been known to indulge in (or a problem I’ve suffered from, depending on source of heat) when preserving fruit, too. I resealed some jars and took additional steps to ensure a good seal. But several of the lids began to dome up again (or just plain leak). This one (pelargonium petals) leaked, as you can see. Luckily I had stored it on top of another jar. Ahem. So much dye lost! The very reverse of a vacuum seal (which is the intention), all of this suggested to me the contents were fermenting. Perhaps the lids were damaged. Perhaps my thermometer was actually faulty… I went off and checked when I had this thought on the weekend. Yes, the thermometer was faulty–the little glass blob that should have held it in a fixed position had clearly broken away unnoticed, allowing the whole business part to slide down by about ten degrees. So… back to the drawing board. I am glad I didn’t use that thermometer for preserving peaches and plums! The jars of fruit all came out just fine, which leads me to think that Stuff, Steep and Store should work for me, as it undoubtedly does for others. Clearly I can manage a vacuum seal under favourable circumstances. The good news on my jars of dye is that it looks like I got colour even though these jars haven’t steeped as long as I planned. 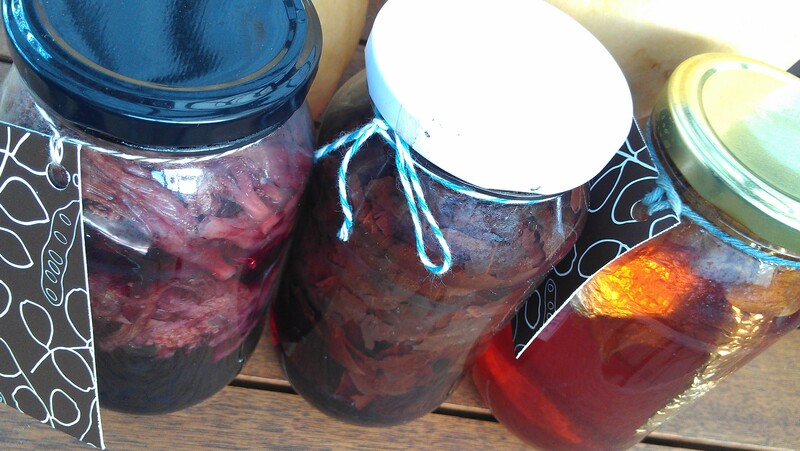 Here they are wet from their baths… and not smelling especially fermented. 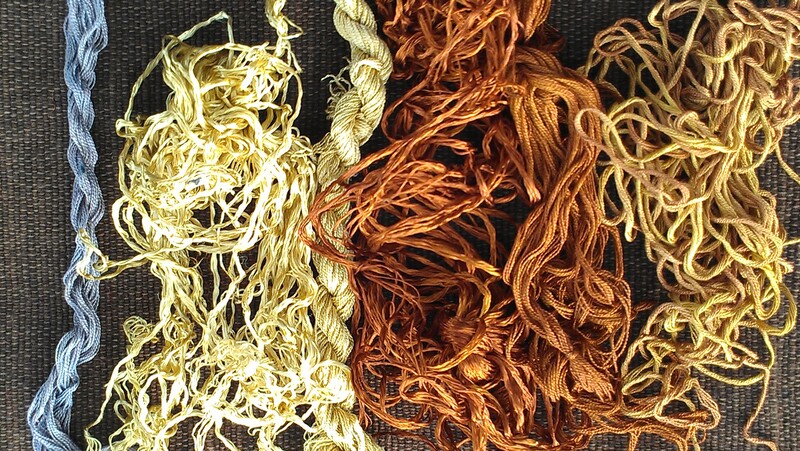 From left to right, pelargonium petals (greyer and less blue than the image); dyers’ chamomile, brown onion skins, and E Scoparia exhaust dye bath on various silk threads. Since it’s my patience and my thermometer and not the method that are at fault… I decided to try again. 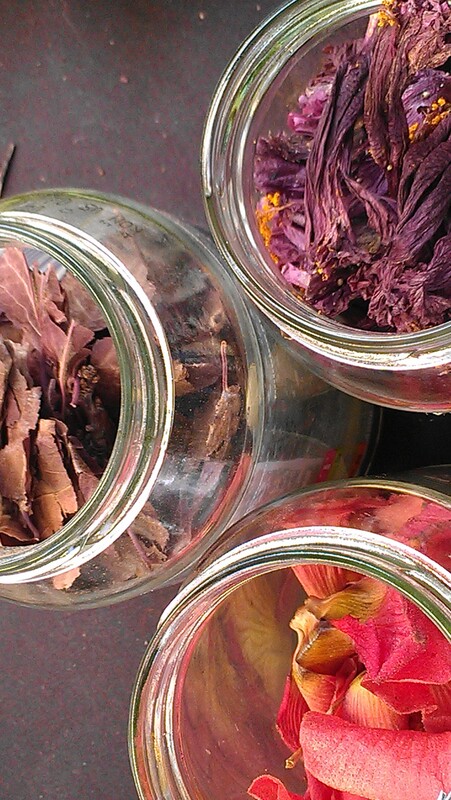 From left to right (below): red hibiscus flowers, dried prunus leaves and fallen flowers from an unusual, purple-leaved hibiscus I found almost at the end of its flowering season when I visited the Himeji Japanese gardens on the weekend. Each with vinegar, sea water, silk/cotton thread and aluminium foil. Wait and see! technical problems .. I have leaking jars too … but will hang on, hoping for no explosions! Can you identify what happened? Stay safe! it might be easier to go back to grandma’s method, discard the thermometer entirely and simply work on observation. heat the bath slowly, have it so that it’s quite hot [depending on the weather/ambient temperature it will show steam, or might not!] but NOT simmering. and grandma used to take her jars out and tip them upside down to cool, thus ensuring a vacuum. i included temperatures in the book because it seems to be a question i am asked very often…but myself i do tend to lean on the old “watch and act”. less precise, admittedly, but works.